Although pickleball has become my passion over the past several years, I’ve played tennis and other racket sports such as racquetball and squash for decades. While we’ve talked about the importance of a good pair of court shoes, players often overlook the importance of a good quality pair of tennis socks. While you could just grab a 6 pack of generic low cut athletic socks on your next trip to Target or Walmart and probably do fine, I really do notice a difference when I wear a good quality sports sock. The material, thickness and ability to wick away sweat have a noticeable impact on your feet- especially if you are on the court for a long period of time. Good quality socks can help reduce the shock of impact and minimize the friction that causes blisters that can cut your game short and leave your feet sore. Comfy socks that cushion impact and keep your feet dry is a winning combination. Our top pick is these Unisex Tennis Crew Socks from Thorlos, if you are looking for maximum comfort you’ll like these thick, cushioned socks. However, these socks definitely are not cheap so we’ve reviewed several other great options in detail below along with our sock buying guide on what to look for before you buy. Related Video: Recommended socks from Tennis Warehouse. These Thorlos unisex socks are medium-thick crew socks made of a comfortable combination of nylon and spandex. They feature a special cushioning in the ankle and Achilles heel area, making them a good option for both tennis and pickleball. If you don’t like the high cut of these crew socks, you can shop Thorlos’ full line of tennis socks here, including low-cut, mini-crew and other lengths, styles and colors. While they are more expensive than the other socks on this list, they’re high quality and durable– these socks boast superb comfort, breathable fabric. The acrylic blend (88% acrylic, 10% nylon, 2% spandex) works like a charm when it comes to moisture-wicking properties -an important factor if you are playing for long sessions on the court. The extra padding at the ball and heel of the sock has been clinically-tested to show that this type of extra cushion protects feet from friction. Friction has been shown to be the biggest cause of blisters so it’s one of the most important factors we considered when selecting the socks for this list. Directly related to that is the blend of fabric used, the use of seamless or low profile seams (to prevent rubbing) and the extra padding in key areas such as the ball of the foot and heel where feet take the most abuse. These socks aren’t unisex like the last pair we reviewed, instead, Adidas offers the model in men’s and women’s variations. These socks are made of Acrylic and polyester materials for the most part, with a small percentage of other materials including nylon, spandex, and latex rubber (roughly 6%). Just like Thorlos socks, they’re “crew socks”, which means that they’re the perfect length for tennis or other racket sports. As for the benefits you could expect, they feature a breathable, highly durable set of materials, and it’s safe to say you’ll feel quite comfortable in them. Note that both men’s and women’s editions are made of the same materials, even though the women’s models look just a bit different. Further on that note, Adidas women’s socks are available in a wide variety of different color variations, including black, heather grey, pink glow, icy blue, and various others. Adidas a household name when it comes to quality sports gear and just made news in the tennis world by signing a record-breaking deal with US Open champion Naomi Osaka as the highest paid endorsement the brand has signed with any female athlete. If you’re looking to dress like Naomi in Adidas gear, you may want to also check out these lower cut Speed Mesh Quarter Socks. Speaking of women’s tennis apparel, see our top picks for tennis skirts and skorts here. 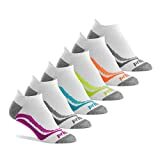 Prince Women’s Tab Performance Athletic Socks are perhaps, some of the best women’s quarter socks you can find for the money. These socks boast moisture-wicking fabric, and on top of that, they’re made with smooth seams to ensure a comfortable fit all around. Each model is pretty colorful on its own while the color variations include four base-color models, such as “black”, “grey retro”, “grey”, and “white”. The stitching along the toe is also smooth with prevents that uncomfortable and bulky seam that you find on some cheaper quality socks. The thin seam reduces abrasion and friction that can cause blisters. Nike’s Dri-fit Cushion Crew socks are pretty plain looking, but they’re superbly durable due to polyester and nylon construction. Other materials feature cotton and spandex, which is pretty great, considering that the overall design could use the much-needed breathability. You can get these socks in a plethora of colors, and you can rest assured that your ankles will be shielded from sprains, cuts, and bruises. Although they are plain looking socks, they are a solid option. I’ve bought a lot of these for my son who played competitive basketball…with daily practice, his socks took a beating and I found these held up well. These are his “go-to” socks although he does have some more colorful socks specifically made for basketball that he keeps for game days. I’ve worn these for pickleball and tennis – they are a good all-around for most sports including racket sports. 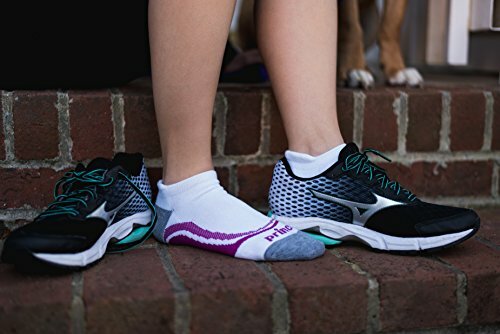 While you may have never heard of the brand since it’s not well known as some of the others on this list, these are actually very popular socks and get overwhelmingly positive reviews, especially when it comes to wearing them for tennis. 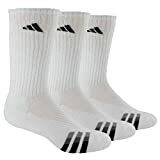 Read reviews on Amazon from customers that mention wearing these socks to play tennis. As far as “budget” they may not be as inexpensive as something like a 12 Pack of Hanes Goldtoe (which honestly I did wear for years before upgrading to high-performance socks), if you work out the price/pair on the Huso socks they are a pretty good deal. What’s attractive about these socks is the multiple fabric blend (42% polyester, 38% nylon, 5% cotton, 5% elastic, and 10% spandex), the lighter heel and toe padding, one-size fits all and the colorful collection. They get good ratings as a thinner, performance athletic sock. It’s unlikely you’ll feel sweaty in these since they breathe well because of the fabric and they are thinner. But please note, if you really need an extra thick cushion to feel comfortable, then these probably are NOT for, if that’s what you’re after then I would scroll back up to the Thorlos for max cushion. If you have sensitive feet, just prefer the feel of a natural fabric, take a look at these Warrior Alpaca Socks. These are made from natural alpaca (and other synthetic fibers). These wool-free socks are designed to keep your feet cool and dry. If you suffer from blisters and don’t get relief from any of the highly marketed socks above, this rather uncommon pick (and expensive socks) might be worth the investment. The terry lined foot pad provides max comfort and cushion while the thinner lining on the top panel of the sock helps keep your feet cool. Alpaca is a natural all weather sock material that helps keep your feet cool in summer and warm in winter. If you suffer from sweaty (or cool feet), these might be the solution. SB SOX Compression Socks: Compression socks may not be too common on the pickleball or tennis court, but there’s plenty of benefits especially if you have poor circulation in your lower legs or feel you need extra support in your calves. If you feel fatigued in your legs after being on the court for a long session, you may want to try compression socks. They may take some getting used to since they are quite a bit longer than regular tennis socks and come up almost to knee-high, but these were specifically engineered to provide superior compression so that tighter feel is by design. Even though compression socks are less common, SB SOX Compression Socks excel in their class for leg support and moisture-wicking properties. Apart from that, they’re quite affordable and feel superbly breathable and cushioned. Players on clay often wear longer and thicker socks. There are no real differences between tennis socks and pickleball socks or other racket sports… but there are certain factors to consider for all of these sports including sock height, material and ability to wick moisture. The four most crucial elements of the best tennis socks: material, comfort, type, and durability. Each of those factors has an effect on the comfort and quality of socks. 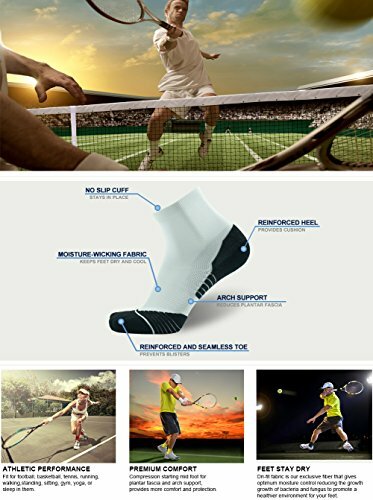 We’ve shortlisted the best options for you below- a good pair of tennis socks is made of high-quality materials that you will feel comfortable wearing while you play on the court The type of socks you get should suit your playing style, while the durability of your socks will ensure that you can use them for many times before wearing thru them. Usually, most athletic socks are now made of a blend of various materials such as polyurethane, nylon, silk, linen, spandex or a blend of natural fibers like cotton mixed in with synthetic. Although many people feel that cotton socks are the most comfortable and the best option, there are actually several reasons to pass on 100% cotton for sports and buy acrylic and polyester socks or at least a blend of materials. Cotton while comfortable, is very absorbent and traps sweat which can lead to increased risk for foot fungus. The damp material also has a tendency to bunch up and cause discomfort and even blisters or irritation due to rubbing. Of course, the right material will provide other benefits as well – socks aren’t just for show and comfort, but they were also supposed to keep your ankles cushioned properly. Combined with a proper set of court shoes should keep you comfortable (and less prone to injury) while you play. Comfort is one of the most important things you’ll need while on the field. It’s tightly correlated with leg fatigue. Namely, a pair of “uncomfortable” tennis socks will eventually drain you down, as you’ll pay more focus and attention to the bothersome feeling of poor quality socks or worse- blisters and irritation. What’s even more important is your subjective feel. That’s, perhaps, the very definition of comfort, and all the more reason for you to consider comfort while weighing the benefits against the potential flaws of the particular model you had in mind. Thin socks – these are obviously the “thinnest” and lightest socks of the bunch. They have the least bulk and are very breathable, hence they dry pretty fast. Most models boast moisture-wicking properties, so people who have problems with excessive sweating should benefit from them the most. Medium socks – even though they’re called “medium”, they’re just slightly thicker when compared to “thin socks”. They provide additional cushioning, and they’re just “thin” enough to be still considered as lightweight and comfortable. The extra bulk provides additional layers of insulation and impact protection, and they’re practically ideal with court shoes for either tennis or pickleball. Thick socks – pretty straight-forward- these socks are a bit heavier than medium socks, but you’ll notice some significant differences should we compare them to “thin sock” models. They offer serious insulation and impact protection, but they’re a bit bulky and quite “heavy”. No-show socks – these socks are called “no-show” because they literally “won’t show” above your shoe. This is the lowest height available, and they offer minimal ankle cushioning. Tab socks – tab socks are improved versions of “no-show” and “low-cut” types that come with an additional tab of fabric at the back of the upper-heel area (Achilles tendon area) to keep the sock from slipping down in to the back of the shoe….the tab also makes it easier to pull the socks on and off. Low-cut socks – low-cut socks can offer a great balance of comfort and cushion for those that don’t like the feeling (or heat) of socks coming too far up their leg. These socks rarely go beyond the mid-anklebone area. Quarter socks – the quarter socks are just a bit higher than low-cut types, covering the anklebone completely. If your heels are prone to blistering due to shoe friction you might want to consider this sock type. Crew socks – Generally, crew socks are high enough to cover 8″ above your shoes. While low cut and no-show are most popular, many tennis players also use this style. Crew socks are great for playing outdoors in chilly weather and if you like the higher cut and comfort of some extra calf support. Knee-high socks – These are usually too high for tennis. 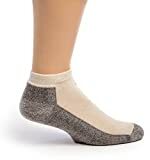 However, we are seeing more compression socks that go end below the knee for extra support and to improve circulation. The material the socks are made with is a key priority when it comes to how long your socks will last. The thin and inexpensive material will, of course, wear out sooner and you’ll end up having to replace them more often. Many of the socks on this list may seem on the more expensive side, but in the long run, a quality athletic socks made of durable material will cost you less since they should last you longer. I’m generally frugal on a lot of things but when it comes to socks, shoes (and underwear) I’m willing to pay for comfort and quality. After trying so many different brands of socks, suffering from blisters and tossing so many low-quality picks, I’m now convinced that in the long run, it’s worth the investment to pay up front for good tennis socks. This is a short video going over the material, thickness and brands to consider. Rafa Nadal usually wears longer socks like these seen here. Finding a good pair of socks for tennis other racket sports presents the challenge since so there are so many brands to choose from. The main things to consider when shopping: the material used, the comfort they offer, that the size is just right and that they’re durable enough to withstand long sessions on the court. Regardless of the racket sport you play, you need a sock that will reduce friction caused by the lateral movements and starts and stops that causes blisters. Material that wicks away moisture to keep your feet sweat-free and dry while also providing extra cushioning. All this talk of keeping your feet comfy and blister-free got me thinking of hands- do you wear a glove to protect your paddle hand when you play? It’s standard gear in racquetball and is becoming more common on the pickleball court- click here to check out our top picks for good pickleball gloves. Affiliate Disclosure: Pickleballportal.com is a participant in the Amazon Services LLC Associates Program, an affiliate advertising program designed to provide a means for sites to earn advertising fees by advertising and linking to Amazon.com. As an Amazon Associate, we earn from qualifying purchases. Amazon and the Amazon logo are trademarks of Amazon.com, Inc or its affiliates. Pickleball Portal also participates in affiliate programs with ShareASale, Skimlinks and other sites. We may earn a referral commission if you purchase through our link at no extra cost to you.